1…2…Three Jail Chicks on the Ledge! I got to the top of the garage at 8am and immediately saw Max sitting on the top of the stairwell roof. Huzzah! Leg band time! I hurried up the incline about halfway back from the stairwell and quickly set up my gear. Max was perched, but he wasn’t sleepy. 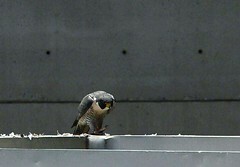 Instead, he was standing up off his feet and staring at the nest ledge. His leg band was in full view. I stared through my scope until my eye started to water. Black “5”. Black “5”. Confirmed. Green…looks like a sideways “E”. Looks like it. In this frenzy to appease my obsession for leg band information, I hadn’t noticed that Max seemed agitated. In fact, between short grooming sessions, he actually was pacing back and forth across the stairwell roof, stopping every turn to stare at the nest ledge. Hmmm. I checked out the ledges. 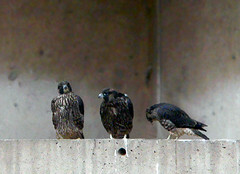 Hercules was sitting over on the niche four from the right, about 2 down from the nest. She, too, seemed hyper-alert. Curious. Max suddenly took off from the stairwell roof and landed on the far right niche. 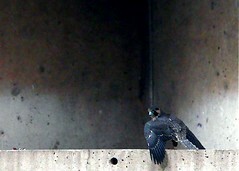 He and Herc vocalized back and forth and he dropped down into the niche. He came out two minutes later and took off to the east. Herc left her perch right after, heading southeast. I checked the time: 8:34am. 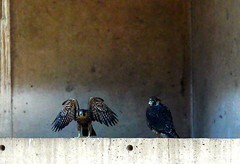 For the next hour, we all three watched the nest ledge. Occasionally, puffs of debris would signal a chick testing wing strength inside, but then all would go still. It started to rain so I packed my stuff haphazardly and went to the level below, which has a great view of the nest and cover from the rain. I set back up and waited. A puff of debris flew up again and then, at 10:38am, a chick. A CHICK!!! He screeched, squawked, tooted and made a general racket while he strutted up and down the ledge, flapping his wings wildly. A couple of times, I seriously thought he was going to flap himself right off the ledge, but he kept his footing. I noticed it had stopped raining and, grinning from ear to ear, I packed my stuff back up and went back to the garage roof. James was standing post and I noticed he was digging in his pockets excitedly, dropping things on the ground and laughing. I was so taken by the little guy that I took about a thousand pictures, many of which you can see in the flickr set. For the next few hours, I chatted with various people while watching the male chick pace his new territory. James came up a few times. Tom stopped up. Mary and Dan called. I called Sean. At 1:22pm, a second chick hopped up on the ledge! This settled the question, at least in my mind, regarding whether the male was a male. The second chick was markedly larger than the first. As well – and I don’t mean this as a gender marker observation, simply a general observation – the second chick seemed less … hyper. She jumped up, glared out and then promptly turned her back on the world while her brother continued to flap and squawk. I wonder what it was like being trapped in a nest for a month with that little ball of energy. Finally, at 1:43pm, the third chick joined her siblings on the ledge. And what a hulking specimen she was. Instantly, she assumed Pose: Vulture and glared, like her sister, out at the world while trying to ignore her little brother, who’s ledge real estate had dwindled past his liking. He shoved past his sisters, trying to maintain his energetic exercises, but they simply stood ground, finally trapping him between them. I have to say, he seemed a bit put out by this turn of events. In looking at the pictures I took and reading a description of chicks at day 35, I see that my timing was probably pretty sound on the hatch date. According to the literature, Over this last week, the chicks should have mostly feathered out, but large, conspicuous patches of down may be around the legs, under the wings and on the crown. 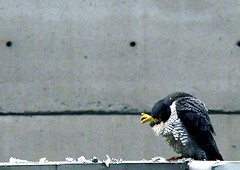 They do a lot of preening as they actively pick out their down. Their activity levels and constant vocalizations pretty much drive the parents from the nest. They rarely visit, except to drop off food. 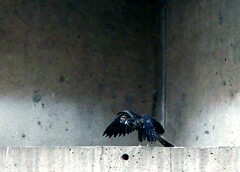 Flapping and hopping around the nest might start to occur as the young begin building wing muscles. You can see this stage here. And what of Max and Hercules? Hercules still perched a few niches to the west, considerably calmed. Max took off to the south between the second and third chick’s appearance and returned at 2:05pm with food. 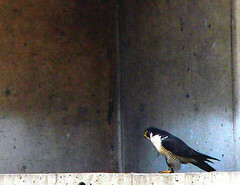 I did not get a chance to see what he had as the chicks virtually swarmed him as soon as his talons touched the nest ledge and he hurriedly dropped into the nest. One by one, the chicks dropped in after him. He came back out moments later and, with one look back down into the nest, took a leap from the ledge and cruised up to the skyperch. I looked at my watch and blanched. My mother-in-law, Suzy, was flying into O’hare from Colorado to stay the weekend and I hadn’t cleaned the house yet. Her plane touched down at 6pm, putting her downtown at 7pm, so I packed my things, bid goodbye to James and Tom and headed home to attend to the domestic front. Exciting day! Note: this series of pictures is grainy, I know. The weather did not provide ideal lighting and the niches, almost always in dark shadow, don’t photograph well even under perfect circumstances. ~ by Steph on June 9, 2006.